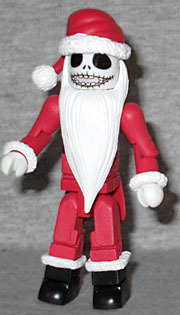 In his bid to break out of his routine, Jack Skellington decided to take Santa Claus' place on one Christmas Eve. But because Halloween is more about theatricality and appearance than any deeper holiday spirit (no pun intended), he thought the most important thing was that he looked the part, which is why his first order of business was to have Sally make him a suit. Because Jack was so tall and thin, he doesn't use the standard Minimate chest - it's a differnt mold that isn't as big around as the usual block, but stretches up about ¼" higher. He has a piece that fits into his waist to create the tattered tails of his suit, and new bits of fur around his wrists and shins (the boots are just painted on, but that's where the fur sits). They also painted his belt, though it's hard to see behind his long white beard. The beard is done cleverly, taking a cue from Lego minifigures: it fits over his neck peg, then the head sits inside it. He has a big happy smile on his face, and is wearing Santa's hat. One holiday icon isn't enough, so Santa Jack is paired with the Easter Bunny. 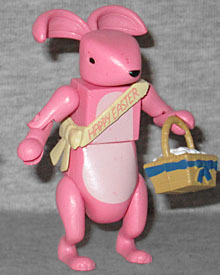 You may recall that when NECA made an NBX Easter Bunny, it was one of my favorite toys of the year - it still is, in fact. In a movie that's all blacks and whites and dark fall colors, something that's bright pink really stands out! Bunny has a normal torso, but that's about it - the head is a new piece, with long ears and a pointy nose, he's got the child arms, a rounded lower torso with a puffy cotton ball tail, and distinct rabbit legs. The yellow sash across his chest says "Happy Easter," and he comes with a basket of eggs. The eggs are just white, not painted with different colors. The set also includes a clear disc stand for the Easter Bunny, but his feet can't accommodate it. Just like Pumpkin King Jack and Zero, this set pairs two really nice figures. And since it's at Toys Я Us, you don't have to worry about squeezing a dozen blind bags to find them! This entry was posted in Art Asylum, MMMR and tagged Minimates, Nightmare Before Christmas. Bookmark the permalink.